Based partially on his own experiences as a musician, first-time director Damien Chazelle has burst onto the scene with a remarkable film. 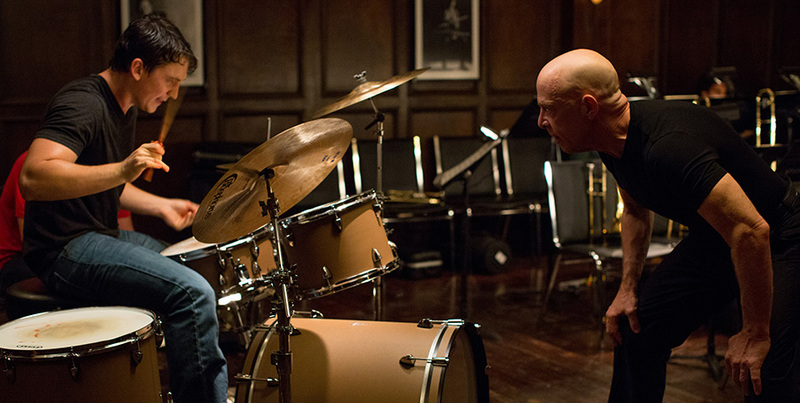 Set in the world of a top jazz school in New York, Whiplash tells the story of a young and hopeful musician motivated to be one of the great drummers after he is accepted into a prestigious band filled only with the top recruits. The film is filled with a frenetic energy that makes it play more like a thriller rather than a story about making sacrifices to follow your ambitions. Andrew Neyman (Miles Teller) is a first-year student at an esteemed music academy in New York. It is his dream to be one of the greatest drummers of all time and this school will lay the groundwork to set him on this course. Upon catching the attention of Terence Fletcher (J.K. Simmons), the sadistic and forceful instructor of the Studio Band, Neyman is invited to join this elite group. In his relentless pursuit to produce the best musicians in the world, he pushes his students past what is expected of them, often to their breaking point. He sees the fierce drive in Neyman and is particularly demanding of him. When Andrew finally falls, his resilience and persistence causes him to keep standing back up. Through blood, sweat, and tears, we are taken on a journey that shows great character depth and growth. Often without even saying a word, we see Andrew’s confidence and determination grow to the point where he challenges his instructor for respect and dominance. When Fletcher attempts to completely throw him off his guard, we see Andrew come back with a performance of sheer brilliance. He finds the drive within himself to go beyond his limits and stand up to Fletcher, culminating in a high-powered and kinetic finale that leaves the audience astounded. This film is a two-man show. Often the supporting players just serve as a backdrop to Teller and Simmons, as they push each other to take their acting to a level never before seen from either. The two are able to emit such intensity that the tension can ratchet up to feverish levels through music alone. Simmons gives a career-defining performance and Teller solidifies himself as one of the best working actors of his generation, as we witness the birth of a genuine star. The moral themes of this film could be portrayed in two ways. It could easily be seen as a snapshot of the determination and sacrifices it takes to make it to the top. However, it could also be seen as validating bullying and humiliation as legitimate forms of motivation. Whichever way the individual viewer interprets it, it’s impossible to deny the talent on display here. This film deserves to be rewarded with recognition, including in the sound design and sound editing fields. Both Miles Teller and J.K. Simmons deliver some of the best acting performances of the year and it wouldn’t be surprising to see their names on the short list come awards season.